These Terms and Conditions apply to all offers, deliveries and services in Germany. They also apply for any future business relationshop without explicit agreement. For deliveries to other countries please contact modellauto18.de for the applying conditions before placing your order. 1. The presentation of products including prices within modellauto18.de do not constitute binding offers. 2. By placing an order you are making a legally binding offer. modellauto18.de can accept this offer within two weeks by transmitting an order confirmation or by delivery of the ordered goods to the customer within this period. The prices stated at the time of the order including sales tax are valid until further notice. All prices indicated are gross prices and include the current rate of value-added tax. For orders up to 150,00 € shipping costs are 4,50 €. For orders above 150,00 € we offer free shipping! For payments with cash on delivery (with delivery to Germany), an additional cash on delivery fee of 6,50 € will incurr. For orders up to 150,00 € shipping costs are 5,95 €. For payments with cash on delivery (with delivery to Austria), an additional cash on delivery fee of 3,90 € will incurr. Cash on delivery is not available! To exercise your right of cancellation, you must inform us (modellauto18.de, Fa. Gierster-Wittmann e.K., Inhaber Florian Wittmann, Vilsvorstadt 11, 13, 15, 94474 Vilshofen, Fax: +49 (0)8541-6753, shop@modellauto18.de) via a clear declaration (e. g. a letter sent by post or e-mail) of your decision to cancel this contract. You may use the attached sample cancellation form; however you are not obliged to do so. You must return or hand over the goods immediately and in any case at the latest within fourteen days from the day, on which you notify us of the cancellation of this contract, to (modellauto18.de, Fa. Gierster-Wittmann e.K., Inhaber Florian Wittmann, Vilsvorstadt 11, 13, 15, 94474 Vilshofen, Fax: +49 (0)8541-6753, shop@modellauto18.de) The period is deemed observed if you ship the goods before expiry of the period of fourteen days. The customer bears the costs of returning the goods. 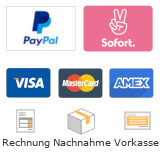 Payments can be made by payment in advance, credit card (VISA; MasterCard; American Express), PayPal, Sofortueberweisung* or by cash on delivery (only in Germany). Additional costs arising from the chosen payment method shall be borne by the customer. *SOFORT Überweisung is an online direct payment method and works on the basis of tried-and-tested online banking. Advantages are: You don't need to register or open a virtual account, highest safety standards and faster delivery of the goods you order online. More information can be found here: www.sofortueberweisung.de. 1. The guarantee period is based on the legal regulations. This is 2 years and begins at the time the customer receives the product. 2. If a warranty claim should occur on a product ordered online, the seller is entitled to choose either to provide a repair or remedy of the fault, or a replacement product. 3. In case the seller fails to repair the problem or to provide a replacement the customer is entitled to withdraw from his contract or to ask for an appropriate reduction of the purchase price. 4. Compensation for consequential damage (due to defects), as well as for any other damage to materials or financial loss, are excluded. The liability limitation does not apply in as far as the damage or harm is the result of intentionality or gross negligence by the seller. Until all the claims against the customer have been fully met, the delivered products remain the property of the seller. We, modellauto18.de take the protection of your personal data very seriously and strictly observe the rules stipulated by the German data protection laws. The following statement informs you on how we will guarantee this protection and what type of data we will collect for what purpose. 1. Place of fulfillment is 94474 Vilshofen, Lower Bavaria. 2. German law applies. Applicability of UN sales law is excluded. Should certain terms of these Terms and Conditions be ineffective or impracticable then the validity of the remaining provisions still remains unchanged.